27.02 Hi PIOTRKOWSKA 155 More than 50% of retail space offered in the building was already leased. 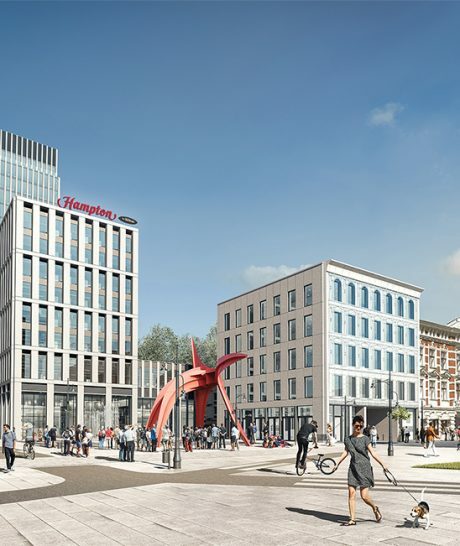 Hi Piotrkowska 155 will consist of two office buildings with retail and service part, and the Hampton by Hilton hotel. 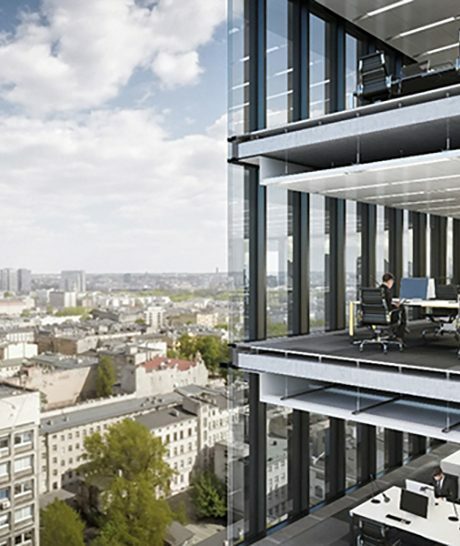 The 20-floor office tower rising 82 m will be the tallest office building in Łódź. The other office building will have 5 floors. In total, they will offer 26,000 sqm of rental space, of which 21,000 sqm will be A+ class office space and 5,000 sqm of retail space. 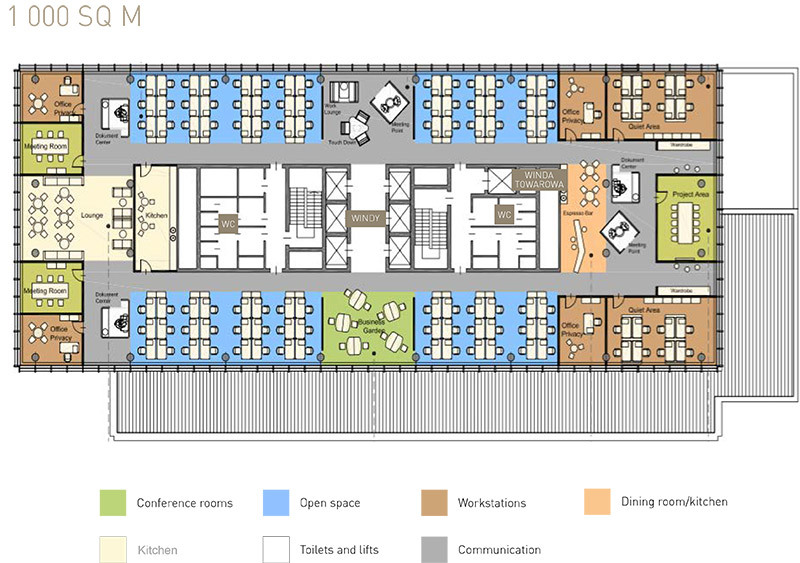 The Hampton by Hilton hotel will offer 149 rooms and restaurant. 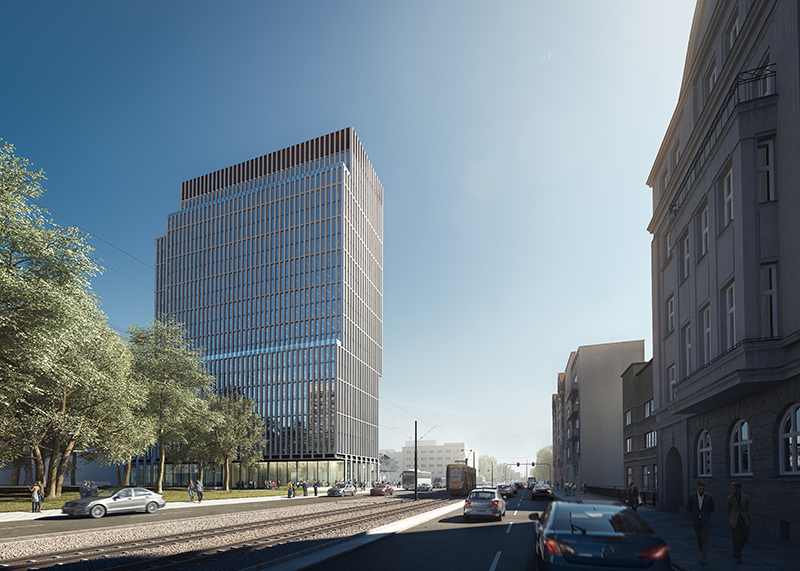 The hotel and the tallest officebuilding in Łódź will sit on a common floor plate of 2,000 sq.m. with shops, cafes and restaurants on the ground floor and medical and fitness centres above. Łódź is an Eastern gate of Europe. There is a direct CARGO TRAIN CHINA – EUROPE which runs 3 times per week both ways Łódź – Chengdu. The central location in Poland enables good connections with the largest Polish cities (only 119 km to Warsaw). The city is situated at the crossing of the railway lines from Warsaw, Toruń, Kutno, Poznań and national roads from Gdańsk, Wrocław, Piotrków Trybunalski and Częstochowa. Moreover, an attractive location is confirmed by crossroad of the main trans-European highways A1 and A2 located approximately 10 km from the city. Łódź is the third-largest city in Poland and an important economic and industrial area. The Łódź agglomeration has about 2 476 315 inhabitants and 247 000 business entities. Thanks to educated graduates and employees experienced in many industries, the city has a low rotation and competitive cost of employment. The great advantage of the project is an excellent location. The complex wil be situated in the centre of Łódź occupying a complete block, bounded by Mickiewicza, Piotrkowska and Kościuszki Streets. Only half an hour is needed to get to express roads A1 and A2 and highways S8, S14. Well organized and accessible public transportation is another essential feature that makes location to be very attractive. Downtown area is also named as one of the gratest offcie hubs in Łódź. 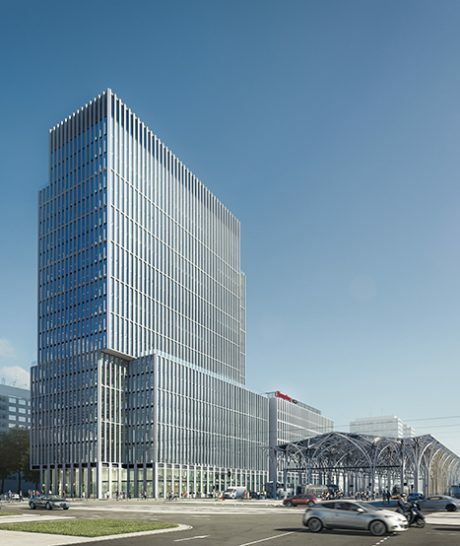 More than a half of the total amount of office space (55%) is located in city center. It’s a 10 minute car ride from the center of Łódź to the international Władysław Reymont Airport in Łódź. A new, four-story passenger terminal with an annual capacity of up to 2 million passengers covers both passenger and cargo traffic. Thanks to significant location, Hi Piotrkowska 155 together with great connection between the nearby districts, became one of the most attractive places to invest in Łódź. A considerable potential of three railway staions: Łódź Kaliska, Łódź Widzew, Łódź Fabryczna and airport facililates access to a wide range of employees from the entire region, with 1.5 million people within a radius of 30 kilometers. The city is proud to offer a considerable potential of qualified staff. About 87 thousand students attends Łódź universities*. Master Management Group (MMG) is an investor, developer, leasing agent and asset manager of retail and office property located throughout Poland. The MMG has over 11 years of experience in the market and a team of experts who have worked for international development, consulting and property management companies, as well as investment funds. As a result, the MMG successfully implements independent projects and cooperates with leading developers and investors. Master Management is a private company offering boutique services at the highest level. Prestigious awards confirm the high quality of services and prove that the MMG team has extensive experience in various fields. The MMG has been a local partner for the world’s largest institutional funds and property investment organizations. On behalf of global leaders, the MMG sources local retail property investments and provides ongoing support with a wide scope of asset and property management services after acquisition through to exit. In the past, the MMG has collaborated with such partners as Marcol Group, Europa Capital and as a joint venture partner with Blackstone. Currently, the MMG manages 100,000 sq m of retail space including: Brama Mazur in Ełk, Galeria Niwa in Oświęcim and centers in: Poznań, Szczecin, Lubin, Kutno, Ciechanów, Piekary Śląskie and Józefosław (MMG Centers*). 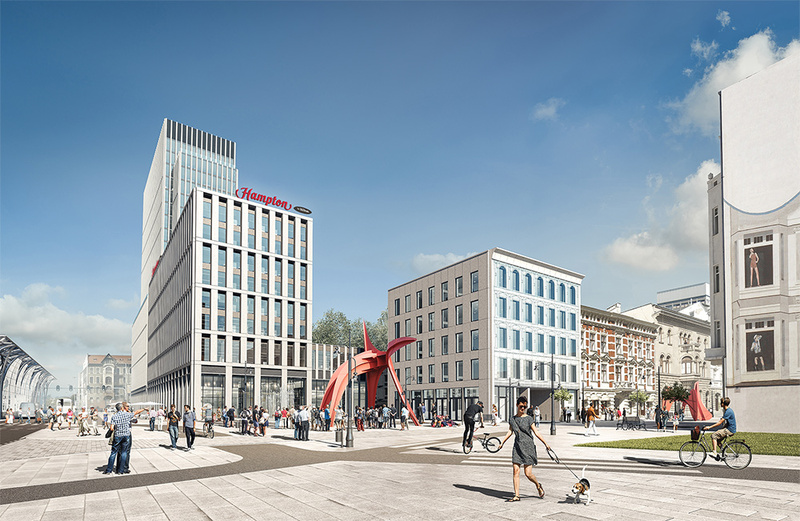 The company is also an investor and developer of commercial space in a multifunctional office and retail complex will be located at Piotrkowska 155 Street in the new Public Transport Hub in Łódź city centre, and an investor and developer in three shopping centers in Kołobrzeg, Legionowo and Zawiercie. The latest project in the MMG portfolio is Forest Park Outlet, the first designer outlet center with a village designed concept in Poland, which enjoys great popularity in Western Europe. The first phase of the project is located in Łomna North of Warsaw,near the Gdańsk route and Modlin Airport, with an area of 16,000 sq. m.
PRC Architekci was established in 1997. In 2007 a subsidiary was created with the aim of focusing on interior design projects for the hotel industry and projects for the corporate sector – PRC Design. The company is listed among the top 15 architects in Poland. PRC Architekci and PRC Design provide comprehensive services in architectural design, urban planning and interior design both in the Polish market, as well as internationally. Projects designed by the studio includes the folowing: Eurocentrum on Al. Jerozolimskie in Warsaw (over 40,000 sq.m. 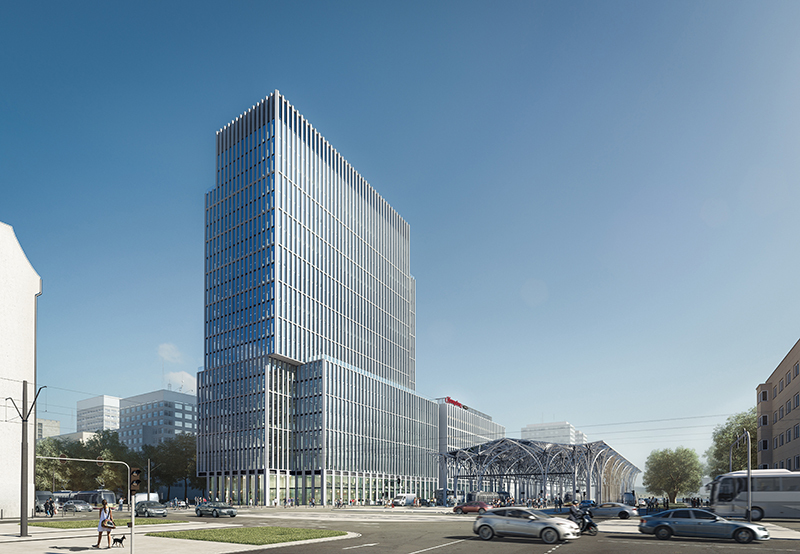 lettable area) – the next phase of 27,000 sq.m. 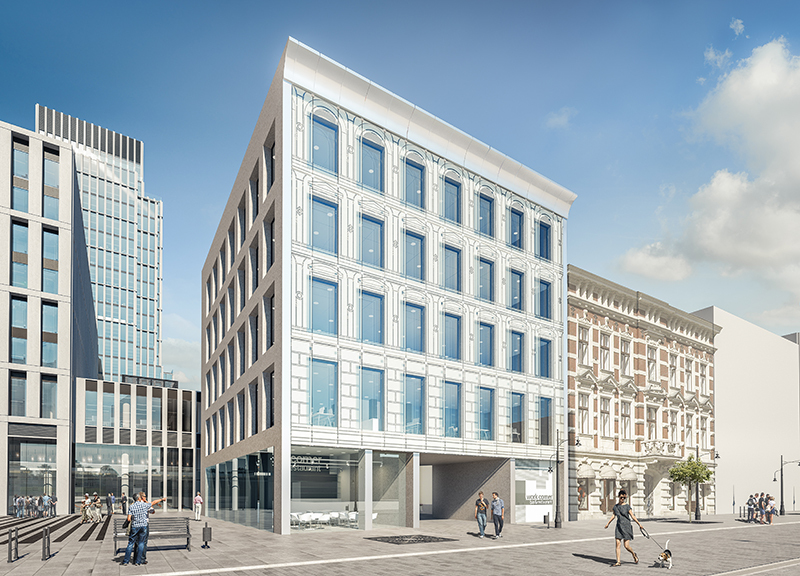 lettable area has just recently started on site; Art Norblin, a major mixed use scheme in central Warsaw generating over 65,000 sq.m. of lettable area of office and retail. 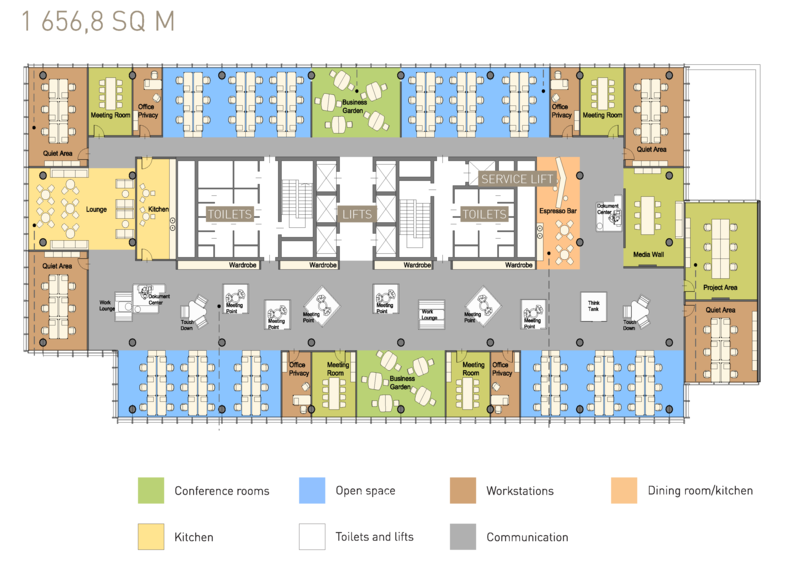 The Company also undertake the workplace design for major office occupiers, such as Orange (43,000 sq.m. ), Citibank 27,000 sq.m. ), KPMG (5,050 sq.m. ), PriceWaterhouse Coopers (5,500 sq.m. ), WBK (11,500 sq.m. ), Unilever (5,156 sq.m.) and Imtech (6,727 sq.m.). The principal of the company is Andrzej Michalik, who for over 35 years has created venturesome, modern commercial and residential spaces, both in Poland and abroad. He is a member of the Royal Institute of British Architects (R.I.B.A.) and the Polish Association of Polish Architects (SARP). 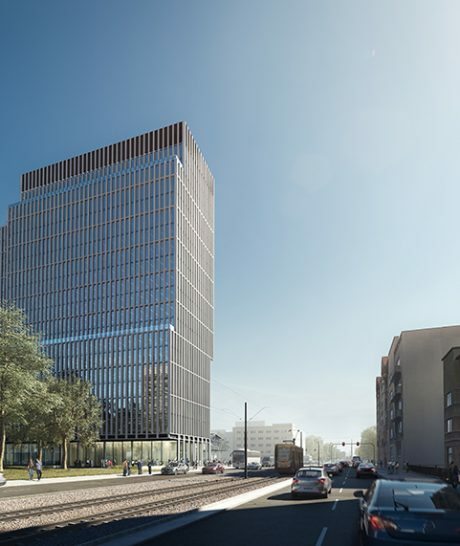 The first building of the complex is the 20 floor office tower arranged in tiers, for which the front entrance will be located on the side of Adam Mickiewicz Street. From the western side the building will be adjoining to Taduesz Kościuszko Street. 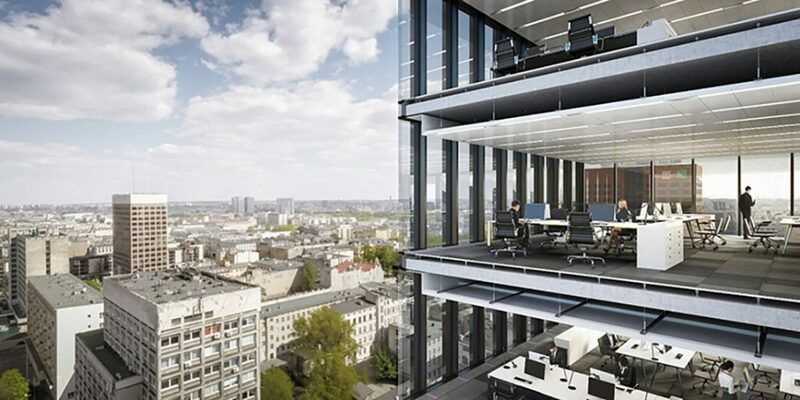 Beside the strategic location, the highest A+ class office building in Łódź, will connect exceptional architecture, the functionality, advanced technical solutions and flexibility in finishing of space. Due to the exceptional flexibility of space, Hi Piotrkowska 155 offices will meet all the standards in the scope of ergonomics of use. Additionally energy-saving and environmental solutions, fulfilling the environmental requirements of BREEAM on the “Very Good” level will also be implemented. What will be unique for the place is the view, which will definitely make the time spent at work more pleasant. The whole recognizable building of the Hi complex, the Hampton by Hilton hotel sets new standards on the Łódź hotel market. A world-famous brand of original and original arrangements that surprise you. There is also an underground car park at guests’ disposal. Property offering 24-hour access to a fitness center, center of conference and restaurant. The proximity of Piotrkowska Street and a wide range of cultural events within reach, otherness and its attractiveness and prestige. The second building of the Hi is a 5-storey office building located at Piotrkowska Street. Due to the historic tenements located in its frontage, the design of the building was consulted with the city conservator. Its facade refers to eclectic architecture, which gave the main direction of development to many outstanding 19th and 20th century tenement houses in Poland. Aesthetic sensations will be complemented by the aroma of coffee, which can be tasted in the Starbucks cafe. A well-known American coffee brand, rented space on the ground floor of the building. 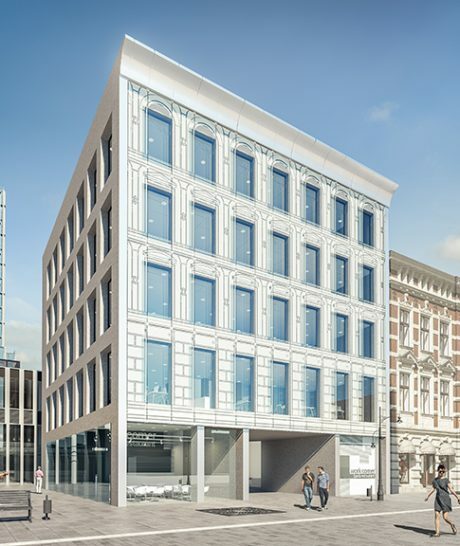 On the other four floors there will be service premises from the beauty, health and fitness and office sectors. The building is located in the centre of Łódź occupying a complete block, bounded by Mickiewicza, Piotrkowska and Kościuszki Streets. 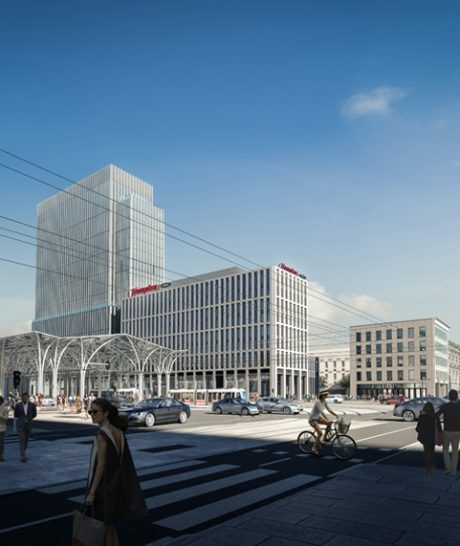 The Piotrkowska 155 project is being built next to the public transport transit hub, which will enable easy and quick interchanges on the lines going both in north-south and eastwest directions, and will guarantee excellent connection with all the districts of Łódź. The stop is right next to the Piotrkowska 155 where the street is divided into a promenade and a part designated for car traffic, which will be a gateway to the very centre of the city. The building is located in the centre of Łódź occupying a complete block, bounded by Mickiewicza, Piotrkowska and Kościuszki Streets. 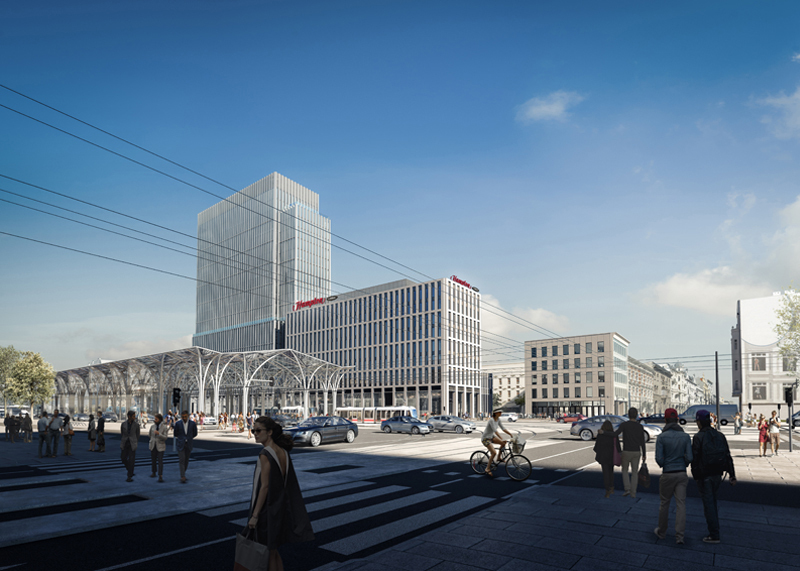 The Piotrkowska 155 project is being built next to the public transport transit hub, which will enable easy and quick interchanges on the lines going both in north-south and eastwest directions, and will guarantee excellent connection with all the districts of Łódź. The stop is right next to the Piotrkowska 155 where the street is divided into a promenade and a part designated for car traffic, which will be a gateway to the very centre of the city. The convenient location of the project opposite an interchange station, commonly known as “unicorn stable”, provides the comfort of access to municipal transport. Piotrkowska Centrum bus and tram stop was modernized as a part of a great city investment: West – East route, linking 12 tram lines and 6 bus lines going from west to east and north to south. Next to the main entrance to Hi Tower and Hampton by Hilton hotel, there is one of the most frequently used bicycle route. The route links three, the most popular bicycle stations: Manufaktura, Piotrkowska Street and Piotrkowska Centrum. Every season 40 000 rents is registered in each of the station. 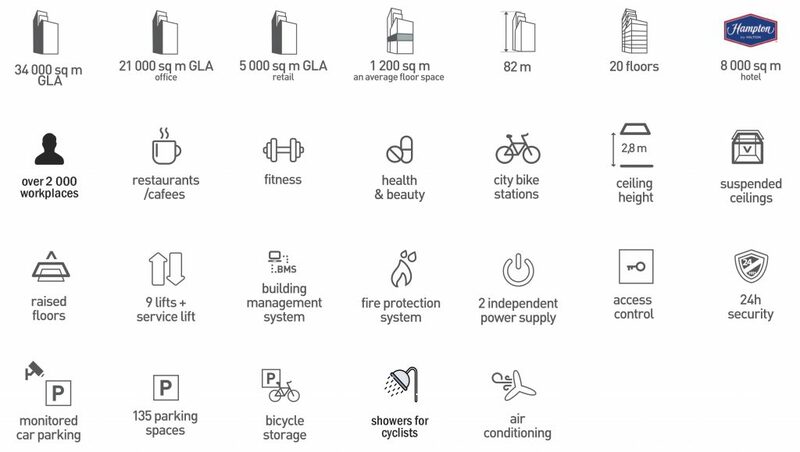 It means that Hi complex will be an important part of bicycle life style and transportation hub in Łódź. Łódzki Rower Publiczny provides an alternative form of transport, allowing its users to move around the city fast. It supplements the municipal transport in Łódź. Łódzki Rower Publiczny – 1534 bikes and 152 stations. When the spring comes, plenty of bike enthusiasts give up cars in favour of single- track vehicle to explore Łódź. Hi PIOTRKOWSKA 155 emerges from the ground. The hotel and the small office building already have a ground floor. Shops, restaurants and services in the heart of Łódź!